Visitors to a synagogue should be mindful of its significance in Judaism. A synagogue is a place of worship for followers of Judaism with its own unique set of rituals and etiquette. 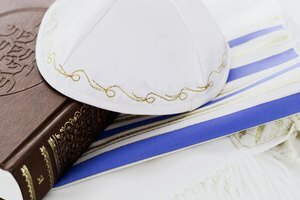 For Protestants, or anybody else not of the Jewish faith, the thought of attending a synagogue for the first time may seem alarming or confusing. What should you expect from your visit, and what rules should you follow to conduct yourself appropriately? 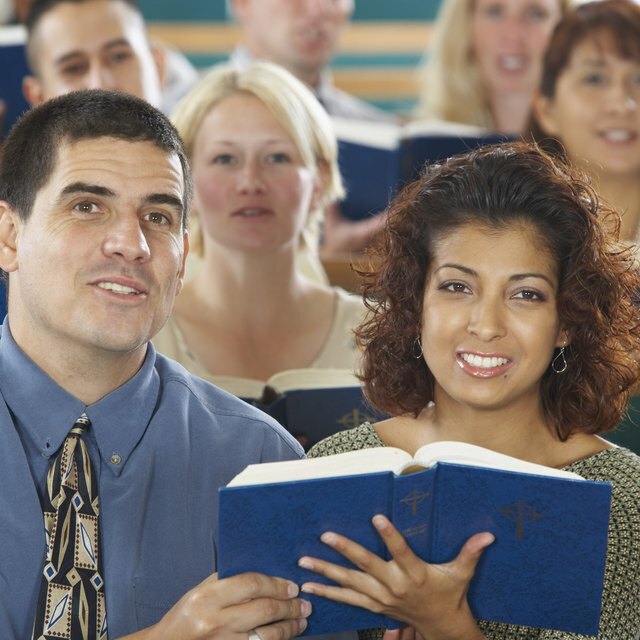 Protestant Christians might worry about being offended or offending others on the basis of the religious differences between Christianity and Judaism. If this worries you, accept ahead of time that certain beliefs espoused at the synagogue won't match your own. Different religions have different beliefs, but many religions also have strong commonalities. Listen for beliefs that complement, rather than contradict, your own. The Protestant denomination and Judaism share a belief in the God of Abraham and the Old Testament --that's a lot of common ground. Don't minister or attempt to convert anyone during your visit, regardless of how strong your personal beliefs are. Members of the synagogue congregation are there to worship their God in the way that they have decided is best for them. 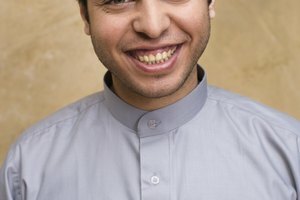 For the most part, synagogues and Christian churches define appropriate dress similarly. In both settings, conservative dress is key. For men, that means clean, pressed slacks with a collared shirt. Some synagogues with a strict dress code also require a jacket and tie. Men customarily wear a kippah (head covering), so if you are visiting, wear one as a show of respect. Synagogues usually provide kippahs if you need to borrow one. Women should wear a dress with sleeves, or a skirt and blouse; hemlines should always fall below the knee. Pants may be appropriate for a woman, but that varies based on the synagogue. Services at a synagogue are like services at a church in that the congregation stands, sits, sings, prays and otherwise participates in the service. You won't be expected to do certain things, such as speaking fluent Hebrew, if you're not Jewish. However, do anything you can do to demonstrate respect and openness. 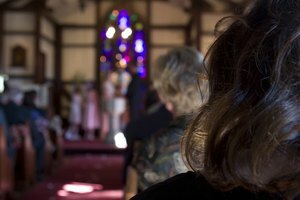 Join the rest of the congregation in standing, singing, and praying, and avoid distracting from the service -- turn the cellphone off, don't take photographs, and don't talk during prayer. Don't enter or leave the sanctuary if the ark, the case that holds the Torah, is open. A sabbath (shabbat in Hebrew) service presents special conditions. The sabbath is a holy day of rest and sacred assembly in the Jewish faith and is observed from sunset on Friday until Saturday night. Strictly observant Jews do not go into work, conduct business, do domestic chores or even prepare food on shabbat. They do attend synagogue on the shabbat, but some elements differ from the traditional service. Carrying anything except the clothes on your back into the synagogue on shabbat is considered unholy. That includes purses and items in pockets. An offering won't be collected, as handling money is considered unholy on shabbat, so don't bring any money into the synagogue. Avoid doodling during the service, as writing is a restricted activity on shabbat. Driving to the synagogue is fine in most Jewish denominations, but if you are visiting an Orthodox synagogue, park off-premises so as not to offend the faithful. With the exception of some very exclusive and strict congregations, most synagogues welcome visitors with open arms. Introduce yourself and get to know some new people! Be honest if asked why you're there. You won't drive anyone away just because you're Protestant and not Jewish. Marsden, Chip. "The Etiquette for Protestants Visiting a Synagogue." 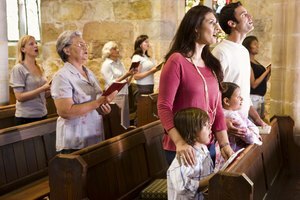 Synonym, https://classroom.synonym.com/the-etiquette-for-protestants-visiting-a-synagogue-12085414.html. 29 September 2017.